Continuing on a previous blog entry about the negative effects of modern human resource groups, what can you do about this? Bloomberg had an interesting article about a company using the web to automate many processes handled by HR. Unfortunately, these are the older and valuable services provided by the "Personnel Department" before it was irradiated and emerged from the depths as the vampire squid devouring creativity, productivity, and morale. Still, cutting HR headcount is a start. 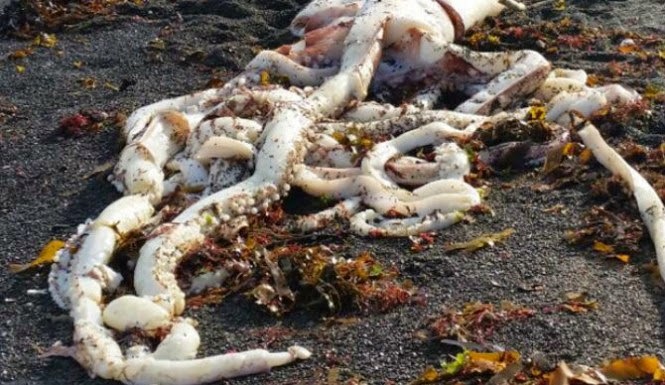 One of the HR Vampire Squids recently washed up in New Zealand (see photo). It was likely slain by a Silicon Valley company who realized the malevolent intentions of HR, killed the beast, and dumped it in the Pacific. Aside from the evil effects on employees, HR can derail the Kings of the Universe, Fortune 500 CEO's. Check out this story in Fortune Magazine about one HR VP named Mary McLeod who managed to chew up two CEOs in a short span of time. I think she is now in the HR Hall of Fame. So watch out for the Vampire Squid called Human Resources and make sure your universally loved CEO is aware of the dangers! What is Behind Obscene CEO Salaries?